CD Review: Girls Against Boys, "Freak*On*Ica"
But you got a big head and look like Elmer Fudd? Cause your friends say you dance like Seinfeld's Elaine? Buy Girls Against Boys and get you some action! Slinky. 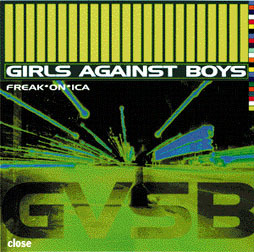 That's the word for the world of GVSB. Kinetic explosions of dirty groove produced water-tight. You can feel the strobe lights pulsing as the sweat pours down your face. Even though the club is packed you still find room to strut. The high-tech catch phrases echo through your head: "Drop the funk. Drop the sonic Pacific" ("Exorcisto"), "Kiss my sound system" ("Speedway"), "The love is good if the loop is good" ("Cowboy's Orbit"). All you people who were swearing blue blazes that the Geffen überlords were going to take away GVSB's chastity belt keys must feel pretty stupid right now, this being their second album for "the man". House of GVSB and Freak*on*ica do nothing but solidify their reputation as house band at Satan's discotheque. Right from the start "Park Avenue" hits you with the big riffs as Scott McCloud leeringly tells us to "check your life span." "Speedway" is rhythmic neon sleaziness with Alexis Fleisig's drums tattooing naughty phrases on your psyche. "One Firecracker" is about the Disneyfication of Times Square, which is going from Chesty to Goofy. "Exorcisto" is one good example of GVSB moving into techno loop territory without sacrificing the grit. The sexplayer is still alive and well.